The Stone of the Sun is a comprehensive treatise of Gnostic wisdom that encompasses great mystical, esoteric, religious, anthropologic, and historical knowledge. The wise ones of ancient Mexico, keepers of transcendental wisdom, left us the pathway, carved in symbols, to take us though a path of radical transformation, so that every true follower of wisdom could find it. This mystical piece is based on the number 3, where we find the very origin of humankind. When conjugated with mathematics and astronomy, it shows the secret path that will eventually lead any ascetic to the realization of their Being. The reflective study of this cosmic stone reveals teachings that guide us in the search of authentic wisdom. The Stone of the Sun is a true map where the laws and the means to reach the final liberation are described, step by step. 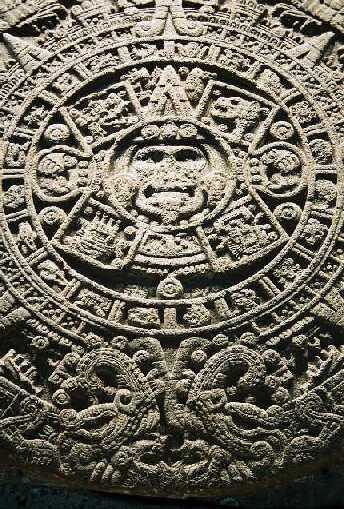 Q – Does the Aztec Calendar hide much information that to this date has not been understood? A – To this day it has not been understood as an integral piece, because they do not understand its rudiments are based of the trigesimal system. It is not even based in the duodecimal system, but in the trigesimal, the number three.” Samael Aun Weor – Conference on the Wisdom of the Being.